It has a cantilever that extends in two directions on the same floor: over The Esquire and over the Riverwalk. Is that what you mean? There has been tons of structural stuff for the cantilever on these last two floors. Going forward will be much more typical columns and slabs going up on the guestroom floors. Major fire at construction site. You can see where it started at around 6:37. What I am confused by is why the floor is higher up than the main part of the floor. I don't know if I explained that correctly. Not sure what you mean. Which is the main part and which is the higher part. Yeah, I knew I would have a hard time explaining. I'll try again when I wake up. The anticipation is killing me! I hope you wake up soon so I can understand what you're asking. In the posted picture, the floor lifted (or added) by the cantilever seems different from the third floor previously added. Also, is the cantilever (all the red steel) permanent? I have never seen these things before. Well, cantilevered floors are intensively load-bearing for the floors above, but horizontally in addition to vertically, so they require more thickness and space to do so. The red trusses seem to be part of the scaffold system to be able to build the scaffold out far enough to pour the concrete for the cantilever. 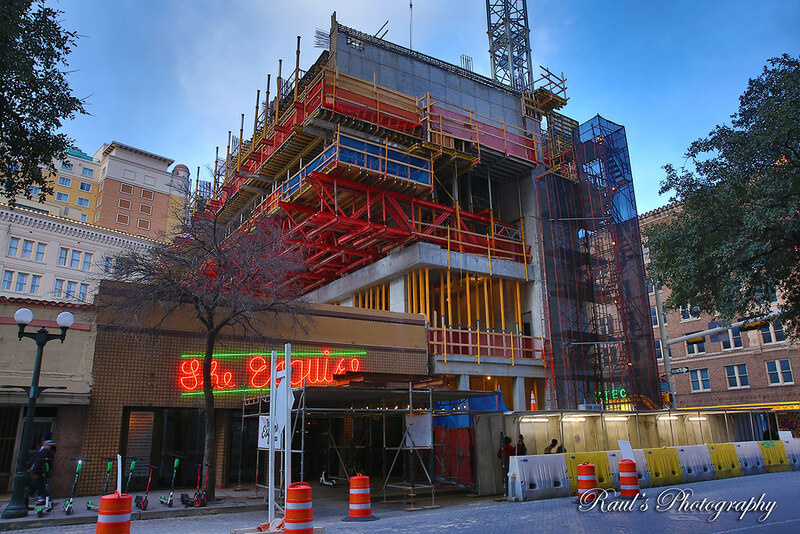 Regular scaffold parts wouldn't be strong enough or large enough, especially with no room to build a scaffold from the ground up in that direction because The Esquire is there. I'm not an engineer, but I think I got that right. Anyone? I can't tell the extent of the damage from the construction cam but this could possibly greatly delay progress. The fire department was there for a good 3 hours. Yes, looking at Raul's excellent photo, you can see that part of the third floor deck is supported by those yellow posts, in places where there is second floor deck below it. Where there is cantilever, they had to put in those big trusses and do a temporary deck (in blue on pic) on top of those trusses, to hold up the scaffolding which is holding up the 3rd floor deck, because the Esquire's 100 year old roof can't support that load. The red trusses and blue temporary deck will be removed. N St Mary's will need to be closed for this, so planning after Spring Break/before Fiesta. The rest of the structure will continue to go up while that's happening. A while back someone asked about the concrete pump thing for upper floors. I think we will see that soon too. I don't think fire will be a big delay, but was definitely an eye-opener! to hold up the scaffolding which is holding up the 3rd floor deck, because the Esquire's 100 year old roof can't support that load. I thought that was another floor. This direct overhead webcam view does nothing for me. It's more like looking at a live floor plan instead of a 3D rendering. I agree, but it is a different perspective. Why they are not using the other webcam is beyond me. The other webcam is still there. Obviously the Drury allowed them to install the webcam on the building, so why didn't they put it in a better vantage point? Fresh concrete pour this morning. That was a lot of rebar! It was more than the typical? Seems like they are starting out fast with the new floor. Let's hope it starts going fast, with a goal of 1 floor per week. Anybody have a new photo? sirkingwilliam? wwmiv? You guys live in San Antonio. I have some projects going on down in the area. I'll see if I can swing by and grab a couple pics over the next few days.